I intended to attend the recent sectional basketball game featuring two teams ranked in the Top 10 of Class A, the Hauser Jets and the Morristown Yellow Jackets. However, I mistakenly drove to Morristown thinking it was there, even patiently finding my way around the unexpected detour in Shelbyville. I quickly realized there was no game when pulling into a rather empty parking lot. Then, I called my wife and asked her to check thinking I had driven right by the actual host school, Southwestern. Of course, she had difficulty not giving me a deserved hard time as she looked up and confirmed it was indeed at Southwestern. I found the game on the radio and listened to the first half while backtracking. We did not get off to a good start, down 16 points at half-time, 22-38. As I pulled into the packed Southwestern parking lot, I was honestly thinking it would not be easy to recover and decided to drive on home while continuing to listen to the game. When pulling into the garage, we were still losing by 16 points, 34-50, by the end of the third quarter. It seemed rather hopeless; thus, I did not continue to listen to the game. I should have known better! When picking up The Republic the next morning, I immediately went to the Sports Section and read the article entitled, "Hauser's Comeback Attempt Falls Short." We outscored Morristown 29-19 in the fourth quarter getting as close as two points before losing 63-69. Last year, it was Oldenburg who found themselves down to us when making a great effort in the fourth quarter to only lose the game. As someone who has played a lot of games over the years in basketball, softball, table tennis, and volleyball, I know what it is like to be in such a game. It is wonderful to be on the winning end while not so wonderful to be on the losing end. When losing that type of game, you sometimes would prefer just to be by yourself. And, that is the primary reason for me writing this article. At church on Sunday, someone asked if I had heard about what happened after the game. 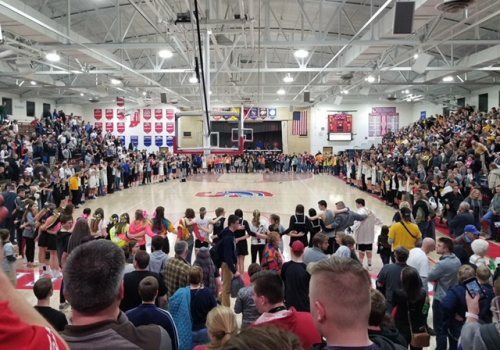 She was there, and she talked about how players from both teams and many others gathered on the floor in a circle for a prayer led by a Hauser player, Alex Gross. It was suggested that I read a Facebook post by Misty Moore. I don't know Misty, but she captured the moment. We received permission from her to pull some of her words. "A special shout-out is in my heart as I look back through pictures and videos of last night's game. ... It was a complete toss up, with each favored to win by different people. ... But, it's all these kids, together, who get the win by showing that Grace wins. Even in defeat, we can praise our Heavenly Father, and that's exactly what they did. ... Immediately after Alex prayed out loud for everyone, he walks in to join arms with his classmates and teammates. And he, as well as others, point to God as they are giving praise and glory to God, no matter their outcome. And Grace wins!" I am reminded of how I loved sports when younger, perhaps too much, when I had a dream that made me think about where my focus in life should always be, God. And, I now will always have the image of all those young people pointing away from themselves. I am sorry I did not attend, for missing a big game but a bigger moment afterward!